my miniature schnauzer does not behave well when passing other dogs. he will twist and/or pulls on the lead. if we try to stop to speak to the other dog, he is usually not happy to speak to them and becomes aggressive or if a dog is behind him, he will continually look behind instead of keeping his eyes forward in the direction he is going. he is 4 years old I have had him for only 5 months now. any ideas? Thanks for explaining the game Robyn. It sounds like it just might work. 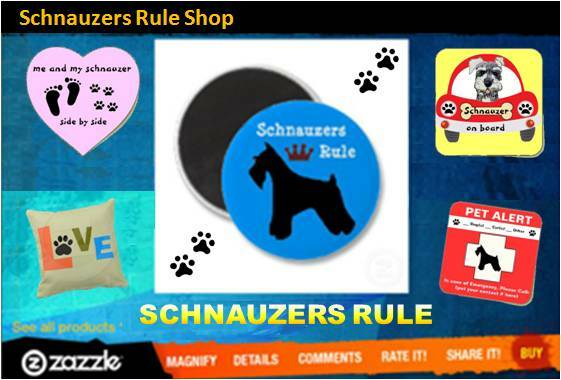 I do have a clicker but my schnauzer seemed afraid of the noise it made when I first clicked it so i never did use it with him. I guess its time to take it out and try again. This game does work, but it takes time. You have to be at a distance where your dog is not reacting to the other dog(s). It also helps if your dog knows what a clicker is. If your dog does not know that the sound of a clicker means a treat is coming you just have to click and treat over and over for a few minutes. Just make sure when you are doing this that the dog is not doing something you don't want to reinforce. Then when the dog looks at another dog say "Look at That" and click on the clicker. When the dog hears the click he/she will look at you because this sound now means treats are coming. Treat and praise! Pretty soon the dog will start looking at other dogs and whipping its head back to you for praise and a treat. Hope this helps! Robyn you mention the look at that game is one of the exercises in the book. how is that done? does it work? We have been doing doggie classes for this same issue. For the class we are currently in the trainer has us reading the book called Control Unleashed. It has exercises to help dogs that are reactive towards other dogs, scared of things, overly excitable, etc. One of the exercises is the Look at That game. Definitely worth trying. One other thing that I don't think is in the book, kind of embarrassing to do in public, but works. Hook a regular leash and a long line to your dog. When the dog starts to react to another dog throw the regular leash down while saying "NO" and run in the opposite direction from the other dog. Either hook the long line to something sturdy or keep a hold of it. I tried this and our dog stopped reacting to the other dog, looked at me and ran towards me. We did this for about 20 minutes and all of a sudden our dog stopped reacting. He started trying to get to the other dog, but just to sniff. Good luck! Correction to I know what you mean! That was, don't let him sleep in your BED!! Sorry. My mini schnauzer is a bit like that as well. Are you using an extendable leash? If so, switch to a 5 foot heavy leather one and when he does this tug hard to correct him. My dog barks in the car as well. Don't let him sleep in your be as he should be your subordinate and not your equal. Good luck. Join in and write your own page! It's easy to do. How? Simply click here to return to Miniature Schnauzer Training .